Hey Beauty Buffs! If you're in the mood to spend $21.50 at Clinique or need to restock on your favorite beauty routine staples then head over to your local Macy's now to fetch a nice little gift with purchase treat! Gotta love free beauty products! I'm a big fan of Clinique mascara so the travel-size tube alone is worth it for me. Luckily, I recently ran out of my favorite powder foundation: Perfectly Real Compact Makeup in Shade 138 so if was an ideal time to nab some goodies for my troubles. 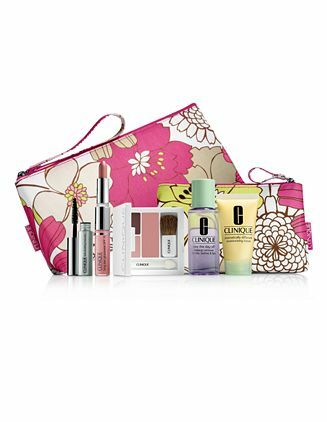 The gift is a $60 value and comes with all the Clinique items you know and love. You do have a choice between compact and lip color shades. -2-in-1 Lipstick & Gloss Duo-Different Lipstick in Think Bronze and Long Last Glosswear in Air Kiss. No matter what shade option you pick, all the gift bags come with travel size versions of Clinique Dramatically Different Moisturizing Lotion, Lash Doubling Mascara in Black, and Take The Day Off Makeup Remover for Lids, Lashes and Lips. If you don't have time to make it to the store you can spend that amount online and be eligible for the gift with purchase while supplies last. The annoying part is that you have to spend $50 or more to get free shipping through Macy's. In the end, it's worth it no matter what. Clinique makes great products and even better gift with purchase treats! Go get yours today!